The shocking news dispatches started reaching the eastern United States around mid-day on Tuesday, March 31, 1931. Eight people – including Notre Dame football coach and athletic director Knute Rockne — had lost their lives in the crash of Transcontinental & Western flight 599 in the Flint Hills of eastern Kansas. Almost immediately, there was an enormous outpouring of reaction. From the halls of academia, the fields of athletics, the boardrooms of business, the seats of government, prominent Americans expressed their shock at the news, and their admiration of Rockne. His fellow coaches, those he worked with over the years to refine and promote the game of football, were most affected. We can find no evidence of any prominent person or organization issuing a “no comment” on that day. In the following days, many thousands made their way to South Bend to pay tribute to the fallen paragon of athletic achievement. His former players, coaches from coast to coast, newspapermen and other prominent folks paid their respects at Rockne’s home on East Wayne Street. The Lifelong Value of Athletics. 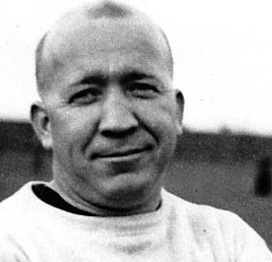 It may seem obvious to us today, but Rockne was one of the first to articulate – passionately and precisely – how participation in athletic development and competition carries dividends far beyond the playing field. Rockne felt that his athletes were receiving an education through sports that was just as important as what they learned in Notre Dame’s classrooms. The Democratization of Football. Beyond its value to the participants, Rockne early on seized on the potential for football to be a spectacle attracting thousands, then millions, of American spectators. His view was shaped by his experience as a Notre Dame player, and the pivotal, historic game against Army on Nov. 1, 1913. On the “day that changed football,” Rockne and Gus Dorais used the forward pass as never before, to open up the game, bewildering the heavily favored Cadets, 35-13. A new, “open” game had been created, in which a team could score from anywhere on the field, as opposed to the long, slow slog offered by the customary “mass play” of 11 bodies slamming into 11 bodies. Rockne knew and appreciated performance, and audience appeal. As Notre Dame coach, he developed an entertaining style of play, with the Notre Dame Shift creating a stunning array of possibilities for each play. At the same time, Rockne used his personality and knack for promotion to help create unprecedented interest in the game nationwide. A gradual shift was occurring. In the earliest years of football, power was concentrated in the East’s Big Three – Yale, Harvard, and Princeton. Games were mostly attended by those with a close connection to each college. 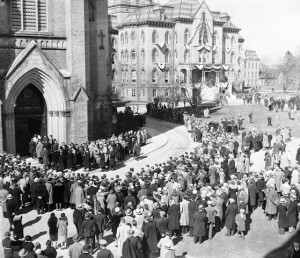 As the game shifted westward, to Michigan under Fielding Yost, the University of Chicago under Amos Alonzo Stagg, and Notre Dame under Rockne, its appeal broadened beyond campus, to local business leaders, and as the work week shortened, to workers themselves. Rock was always at the forefront, seeking the largest stadiums, keeping ticket prices affordable, and using every possible means to promote the game he loved. When he took his 1924 Fighting Irish to play in New York City (vs. Army), Chicago (Northwestern) and southern California (Stanford), he had literally taken the game from coast to coast. It’s About More Than Wins and Losses. That may seem a strange phrase, given that Rockne achieved the highest winning percentage (.881) of any major college or pro football coach in history. Of course he wanted to win, and drilled his teams thoroughly, covering every possible detail to put them in a position to triumph. But the greatest victory, he felt, was gained over oneself. Like the ancient Greeks, he knew the first rule of any achievement was to “know thyself.” In athletics, that meant identifying one’s weaknesses, and making those your strengths. With his strong background in track and field, striving for one’s personal best was the first rung of success. And when the games (mostly victories) were over, Rockne did not rest of his laurels. Can you imagine a coach today sitting down with his defeated counterpart after a game – and diagramming the plays he just used to beat them? For Rockne, success was something to be shared, not hoarded. He did it best at his summer coaching schools. Held on college campuses from Williamsburg, Virginia to Corvallis, Oregon, from Superior, Wisconsin, to Dallas, Rockne shared “the Notre Dame system” with thousands of high school, prep school, and small college coaches over the course of his career. The ultimate goal? To create a winning program, sure. But moreover, to create an experience in which young athletes could learn about themselves, the value of hard work and perseverance, teamwork, sportsmanship and a host of other lessons. Jim Lefebvre is author of the national award-winning, comprehensive biography Coach For A Nation: The Life and Times of Knute Rockne. He writes at Forever Irish (www.NDFootballHistory.com) and www.CoachForANation.com.